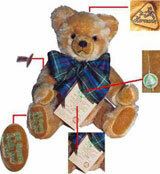 Hermann Spielwaren GmbH Musical Teddy Bear. He plays the Kinder-Sinfonie (Children's Symphony). The "Children's Symphony" Composer Franz Joseph Haydn (March 31, 1732 - May 31, 1809) was an Austrian composer. One of the most important, prolific and prominent composers of the classical period, he is often called the "Father of the Symphony" and "Father of the String Quartet" because of his important contributions to these genres. He was also instrumental in the development of the piano trio and in the evolution of sonata form. Hermann Spielwaren GmbH create beautiful Mohair teddy bears in Coburg, Germany in the traditional style. They have produced teddy bears for the world for three generations. Classic Music Series, Hermann-Spielwaren Coburg GmbH Mohair Bear 42 cm. 16.5 inches tall. 19229-7. European Edition. Classic Musical Bear -he plays the Kinder-Sinfonie (Children's Symphony). Limited Edition Of 500 pieces.